Super Easy English Language Setup, and English Manual and Firmware Update Available at the Samsung Official Website. 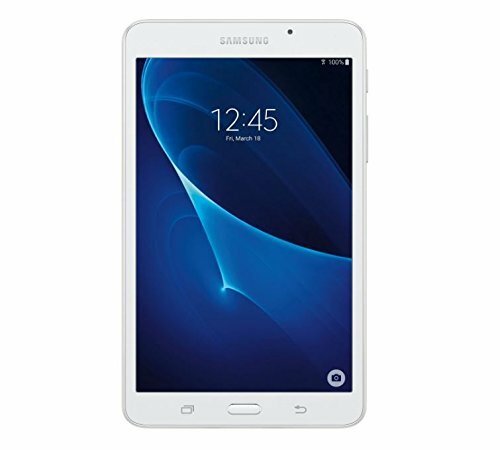 The white 7.0" Tab A 16GB Tablet from Samsung delivers powerful performance and wireless content sharing in a sleek, modern design. This tablet is powered by a quad-core 1.3 GHz Snapdragon 410 processor and has 1.5GB of RAM. It comes equipped with 16GB of built-in storage, a micro-USB port for data sharing, and a microSDXC card slot that supports up to 200GB of additional storage capacity. For high-speed Internet connectivity, Wi-Fi is built-in. Bluetooth 4.0 connectivity is also integrated for wireless pairing with compatible devices, such as headphones and other Bluetooth-enabled accessories.